The Dreamcast (like most other 6th generation game consoles) outputted most games in 480i, with some supporting 240p and 480p. If you’re not familiar with those terms, I highly recommend you read my 240p page before continuing. All 480p Dreamcast games look great through VGA and if you have a display that supports a 480p input, then that’s by far the best output method in most cases. If you use an RGB cable, the few 240p games that are available will look great, but all other games will only output in 480i. As a result, an RGB cable is only a good option if you’re using a display that only supports 240p and 480i. Retro Gaming Cables will soon be releasing a SCART cable that supports both 240p/480i and 480p modes. This is compatible with the gscartsw, OSSC and all RGBs monitors such as Sony BVM’s. VGA / SCART Cable By The Foo: https://ebay.to/2OVIFL3 – I’ve only started testing this solution, but so far the voltage output is safe in all modes and it performs as advertised. Hanzo: It’s the same as the Toro, but without a sync combiner or SCART output. Kuro: While still a high-quality solution, the Kuro is simply a VGA / RGB output box. Kenzei: The Kenzei is a sync combiner that takes any RGBHV signal (such as what’s outputted by the Kuro and Hanzo) and converts it to RGBs via SCART and RCA outputs. This is extremely helpful for people with monitors or upscalers that only accept 480p via RGBs. As an FYI, adding an Extron RXi at the end of your signal will accomplish the same thing, but you may end up needing custom cables. Also, if you’re not familiar with the terms “RGBHV” and “RGBs”, please read the sync page for more information. Most of the plug-and-play HDMI “cables” I’ve tried for the Dreamcast work very poorly. Most aren’t compatible with any 480p/240p game, some have a very soft output and others barely work at all. Luckily, they don’t seem to add lag, so they don’t completely ruin the experience. In my opinion, these are only good if you need a very cheap solution, or if you just need a temporary solution to hold you off. In my opinion, the only “Dreamcast HDMI Plug-and-play” that does a decent job are the Akura and Gekko boxes by the Behar Bros, which are simple analog to digital converters; Using a switchable analog cable and the OSSC will output a better image, but the Gekko is only $55, making it a good contender for people who only need HDMI output from their Dreamcast. One thing to note is all VGA analog to digital converters won’t correct the aspect ratio and sampling issues. More on that below. By applying the wrong sample rate you not only lose 43 pixel columns, but neighboring columns also get fuzzy and blurry and since the 43 columns are evenly distributed across the screen your whole image gets a rather fuzzy look. It’s funny, because there were many times over the years I saw a Dreamcast’s signal and thought it looked a bit soft. Looking back, I wonder if this was what I was always seeing. Another problem is that while the DC’s signal technically is a 720x480p DTV signal, only the inner 640x480p area is actually used. Any A/D conversion will sample the pillarboxes to the left and right as part of the active image, so you always end up with those aspect ratio problems. 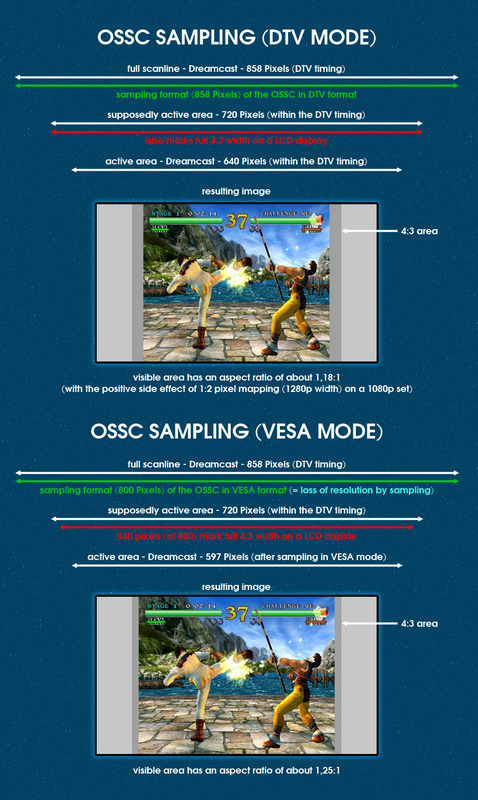 The aspect ratio problem is even bigger with DTV sampling (1.18:1 without correction while VESA sampling gives you 1.25:1). You can try using a VGA to component converter to solve the sampling problem, as all component to HDMI converters use DTV sampling rates instead. I guess you could then even go from component video to HDMI and while this retain’s the Dreamcast’s picture quality, you’ll still end up with the wrong aspect ratio. You can use a OSSC to apply a DTV sampling *AND* reduce the active image area to 640 pixels, basically creating a VESA signal from the DTV signal. This solves both problem, but can bring compatibility issues, as not all TVs can accept a 858 px wide signal with just a 640 px wide active area. The advantage on the other hand by using a correctly sampled DTV signal without AR correction, is that you get a 1:2 pixel mapping on the horizontal on a Full HD screen. The DC will fill a 1280×1080 area in the middle of the screen, giving you a quite narrow AR, but certainly the best possible picture quality you can get from a DC. By altering the active image area to 640px instead, the signal gets scaled to 1440×1080 instead, so you no longer get an integer scale on the horizontal. Of course you can get proper 4:3 now, but at the expense of some PQ. Some TVs can show 1280×960 from a 640x480p signal, which combines the best PQ with the correct AR, but of course you have to deal with the underscan. A huge thank you to Fudoh for helping with this, as I still find it massively confusing. Effected Games (most): Giga Wing, Skies of Arcadia/Eternal Arcadia, Street Fighter Alpha/Zero 3, Super Street Fighter 2 X, Touken Retsuden 4 , Vampire Chronicle for Matching Service, Pop ‘n’ Musci (all 4). If you run the 480p VGA signal through an Extron Emotia, you can force a 240p mode. I’ve tested this method and in my opinion (when using a display that doesn’t support 480p), a “forced 240p mode” looks better than 480i. Check out my 240p page for more information. If the original game is under 800MB and you use good quality (Tayo Uden) discs, you can safely play backups on VA0, VA1 and some VA2 Dreamcast consoles using a software patch. Using cheap media is very bad for your GDROM drive and will absolutely wear your drive much faster than with regular games! Also, games over 800MB (GDROMs can be over 1GB) will either have to be compressed or split to multiple discs. Overall, improper use of CDr’s are not recommended and using an ODE is overall a better choice. – If you’d like the best analog output from your Dreamcast, purchase a video output solution that supports both video modes. You’ll be able to play your favorite games in a way that looks best on every display you use it on. 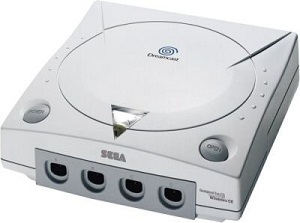 – Using Dreamcast on a flat-screen can be complicated. The best way at the moment is using the DCHDMI or an OSSC. – I like using ODE’s to play my DC games, as patching and options are applied much easier. Sega Dreamcast White Console (NTSC) 1 Controller W/2 Games Bundle WORKS GREAT! Sega Dreamcast lot with 4 controllers, 2 memory cards and 1 game! !